LTVCA – Lake Erie Shoreline and Erie Shore Drive – Watershed Conditions – Flood Outlook – September 25, 2018 – 12:15 p.m. The Strong Wind Warning for Western Lake Erie issued by Environment Canada’s Marine Forecast continues. Weather forecasts are calling for sustained winds to remain around 30 km/hr from the south or southwest for the rest of the afternoon and this evening. Overnight sustained winds are expected to increase to 40 km/hr from the southwest before shifting to more westerly and eventually northwesterly on Wednesday morning. Wind gusts could reach 60 km/hr. The Marine Forecast is predicting waves on Lake Erie to be around 1.5 m during this period. Long range forecasts are inconsistent with the Marine Forecast suggesting the potential for further Strong Wind Warnings on Thursday and Friday. Overnight and this morning there was some flooding on Erie Shore Drive in Chatham-Kent. The forecasts for the remainder of today and Wednesday call for slightly calmer winds and waves, but there is the potential for further flooding and wave related damage in the area. Strong winds will be driving waves onto our Lake Erie shoreline in Chatham-Kent and Elgin County. There is a risk that wave action could damage shoreline protection works and cause shoreline erosion in other areas as well. 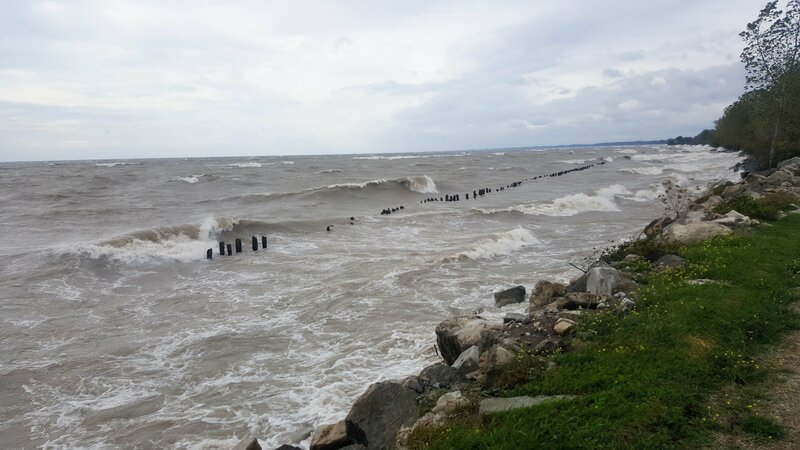 Residents along the Lake Erie shoreline should pay attention to weather forecasts and prepare accordingly. This message will be in effect until September 27, 2018.